Eating out when you are on a diet is, or could be a painful and frustrating experience. Even though this seems more like a punishment, and it does no matter how you slice it, it is actually a good way to start learning about not splurging and just eating normal portions and healthy foods. Fancy restaurants or dive-in fast foods, the menu most likely is screaming with fatty foods and heavy deserts. Remember fat carries flavor and with enough salt and sugar added on almost any crappy meal can be made palatable. So be on the alert. Here are 3 tips to help you fight off the sneaky chef. Eat something very light at home, just before going out. Have a few nuts and half an apple or whatever you like just to cut the edge off those hunger pangs and gain enough self control. We are programmed to eat as much as we have in front of us (sometimes even more….) but if you have a plan, think about this before you get to the restaurant you are more likely to succeed in fighting the genetic curse. Control the quantity of food you are going to consume. Order a smaller portion and if not possible then plan on taking home a doggie bag. Remember to chew your food slowly (you might want to look sophisticated and refined in front of your company anyway). Eating slowly will give your brain enough time to register the amount of food consumed and send the satiety signals so you can feel full and happy; it also gives you and your company a chance to enjoy the evening out longer. What you order makes a difference. 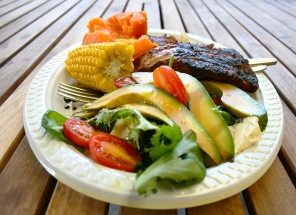 Order grilled meat with veggies instead of deep fried or sauce laden foods. Sauces contain a lot of fat and sodium and most likely sugar too. Of course choose a salad instead of fries but be careful what kind of salad dressing you get. Sometimes we think we are being so good to order a big salad and forget about the salad dressing that, if not careful, could add up to the same amount of calories as an order of fries! Now you have 3 tips that will help you along when eating out. Think of these tips in a positive way and one that will add to your overall eating out experience. Our minds are wonderful creations and we do have the power to influence the path we take which is either the happy path or the not so happy path.